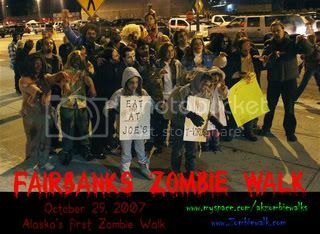 Diary of the Dead premier - Zombiewalk.com - Your source for all Zombie Walk and Zombie Flash Mob planning! Georger Romero's new zombie masterpiece Dairy of the Dead should be released soon- before Xmas. We have tentativly planned a "Gathering of the Dead" for the opening at the local theater... so if there is enough intrest I will try to get the theater to ******** some tickets and such. Also a "Best Zombie Costume" contest? When the dead walk, you know you can count on me being there! for updated zombie movie and Zombie Gathering information! “Dairy of the Dead” gets a sequel… and movie is not even out yet! (Still no word on official release date) And another Romero movie gets a remake- Day of the Dead!!!!! Planning a gathering at the theater for one of these two…. Or both?!?! ?